The following bulletin was included in a public release of the City of Laguna Beach's ordinance prohibiting the "carrying or possession of items and articles generally considered a weapon . . . while attending or participating in a demonstration, rally, protest or other public assembly." (U//FOUO) Improvised weapons found at lawful protests – During a recent lawful protest in Orange County, local law enforcement officers discovered various improvised weapons in the possession of protesters or concealed and placed in the vicinity of the protest. (U//FOUO) Improvised weapons recovered from the protest included stabbing weapons similar to ice picks, stun guns, automotive parts, and padlocks on chains. Similar weapons have been recovered at protests throughout the country, and include tools, brass knuckles, knives, slingshots, bricks, and flares, among others. (U//FOUO) Public safety personnel should remain alert to individuals possessing, concealing, or attempting to pre-stage weapons in or around protest or special event areas. Suspicious packages or individuals carrying or concealing suspicious items should be immediately reported to local law enforcement or security officials. (U//FOUO) Probationer with list of explosive precursors – On 12 August 2017, local law enforcement made contact with a subject in a vehicle. The subject, who was determined to be on probation, was detained and the vehicle searched. Officers discovered a knife and drugs, as well as a list of items, including suspicious materials. • (U//FOUO) Disposition: The incident has been forwarded to the FBI for follow-up. 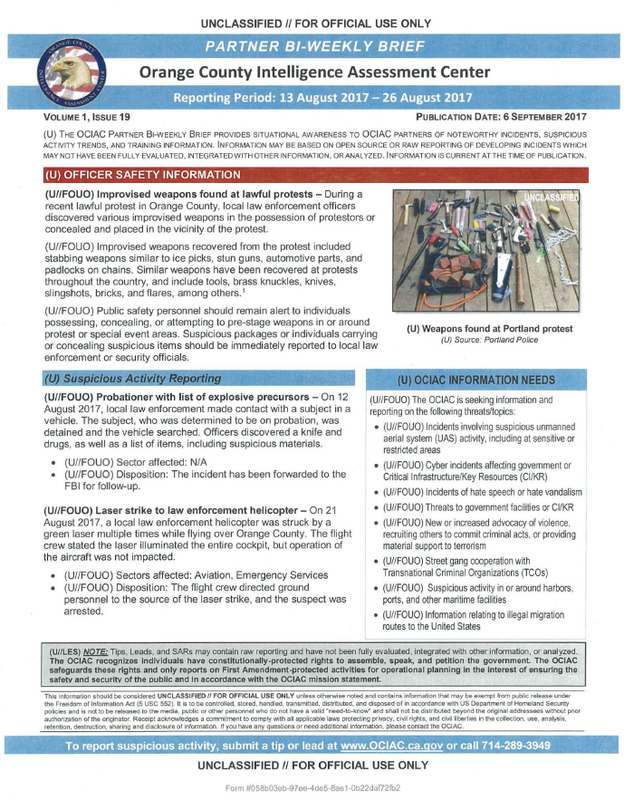 (U//FOUO) Laser strike to law enforcement helicopter – On 21 August 2017, a local law enforcement helicopter was struck by a green laser multiple times while flying over Orange County. The flight crew stated the laser illuminated the entire cockpit, but operation of the aircraft was not impacted. • (U//FOUO) Disposition: The flight crew directed ground personnel to the source of the laser strike, and the suspect was arrested.